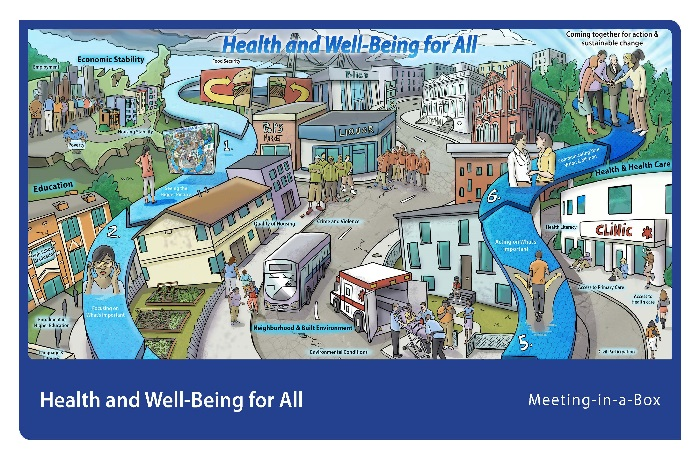 Health and Well-Being for All promotes teamwork and cross-sector collaboration to address social determinants. Working with partners maximizes the impact on the health of individuals and the communities in which they live. Health and Well-Being for All has been tested by various audiences, from health care to academia. What is included in Health and Well-Being for All? · Discuss the determinants of health—including socioeconomic, behavioral, environmental, and other factors—through a facilitated discussion and prompts. · Compare and contrast the internal and external issues faced by key stakeholders through a role play exercise. · Identify strategies for moving from group alignment to cooperative action through collective brainstorming. Who should use Health and Well-Being for All? How can you use Health and Well-Being for All? “Health and Well-Being for All” originated with materials created for the CDC Experience Applied Epidemiology Fellowship for medical students, funded by Pfizer External Medical Affairs, Inc. through a grant to the CDC Foundation.